Let’s change gears and talk about those lazy teenagers. Aren’t they frustrating? It’s so difficult to get them to act maturely and get up in time for school. Well, maybe not so much. It turns out sleeping later is probably normal in the teen years. According to Mary Carskadon, PhD of Brown University Medical School, melatonin (the hormone that drives the sleep-wake cycle) starts later and persists far longer as pubertal development progresses. Teens’ “Circadian rhythm” also appears to be more on a 24.3 hour clock; so fitting into a 24 hour day can be problematic for them. Simply put, an 11pm to 8am sleep schedule would be a more normal expectation. And it’s a real problem. According to the National Sleep Foundation, adolescents need 8.5 to 9.5 hours per night. Only 41% of 6th to 8th graders, and 13% of high schoolers consistently sleep that much. And you cannot “catch up” on weekends. According to Dr. Judith Owens, lead author of an August 2014 American Academy of Pediatrics policy statement on teen sleep needs, lack of sleep is associated with all of the following health problems: obesity, type 2 diabetes, high blood pressure, depression, suicidal thoughts, risk-taking behavior, and automobile accidents. What’s a parent to do? A. Set a curfew on the use of electronic devices (including phones). Studies demonstrate that light from most electronic media can suppress melatonin. Teens should not go to sleep with these devices in their bedrooms. B. Limit caffeine — 31% of teens drink 2 or more caffeinated drinks per day, which is also clearly associated with disrupted sleep patterns. Be aware that many popular drinks besides coffee, tea, and colas contain caffeine. C. Help your children avoid leading over-scheduled lives. The scheduling and the stress can wreck havoc on sleep schedules. Guide them in choosing activities or interests that are useful and/or inspire their passions. We, as adults, know that the world can be a challenging and demanding place. But they simply don’t need to see all of that yet. They’re still kids. Make sure they have plenty of time to relax, have fun, and rest. In my previous posts, I discussed ebola and enterovirus–both serious problems that we all have been following in the latest news reports. I have urged perspective. Let’s recall some statistics. As of this posting there has been one person who has died in the US of ebola and there have been 2 nurses who have since tested positive for the virus. The CDC has confirmed 796 EV-D68 infections in 46 states as of October 16. 2 children, including a Hamilton, NJ 4 year old have died “with”(as opposed to “from”) the infection. That is heartbreaking and tragic. However, keep in mind that currently there is no specific treatment or prevention for these infections. Now let’s consider influenza. Estimates of flu infections vary, but generally there are as many as 200,000 people hospitalized and 36,000 deaths annually in the US. Pediatric deaths vary from 36-71 yearly, but in the 2009-10 outbreak 348 children died. Now, please recall that the influenza vaccine is both safe and effective. But it gets even better: it turns out that immunizing your child will protect your entire family, and especially your senior citizen loved ones. Flu shots are a major public health advantage for the entire community. Recently, a patient asked me if it might be advisable to home school her child to protect her from the recent outbreak of enterovirus D68 (EVD68). I smiled and pointed out that she had driven to my office for her child’s visit despite over 30,000 US traffic fatalities annually. We accept reasonable risks in life for achievable benefits that outweigh the very small possibility of danger. There are many, many advantages for our children if they are able to attend school with their friends, for example. EVD68 is one of over 100 non-polio enteroviruses; it was first identified in 1962 and known as a human pathogen since 1987, mostly occurring from late summer to early fall. It is spread by contact of mucous membranes (eyes, mouth) with respiratory secretions from an infected person. It mutates as do most viruses and this year’s “model” seems to be particularly contagious (easily spread) and virulent (worse symptoms). Since August cases have been reported in all 50 states including a Hamilton NJ 4 year old who, tragically, died. Please note that the child died “with” but not necessarily “from” the infection. It is also noteworthy that there have been reports of EVD68-infected children developing symptoms of weakness or even paralysis; however, these episodes have been transient and it is far from clear that EVD68 is the cause of those occurrences. Most EVD68 infections cause typical URI/”cold” symptoms–mild fever, congestion, cough, body aches. Many children may not develop even that. There is no medication to prevent or treat infection. I advise my patients to drink plenty of fluids, rest, take OTC analgesics and to call me if symptoms worsen to rapid breathing (1 breath/second for a time period greater than 1 hour) or labored breathing (skin sucking in between ribs or above clavicles–“retractions”). Asthmatics are at greater risk. Following CDC guidelines, I advise my asthmatics to faithfully take their maintenance medications, be sure that rescue medications are up to date and that we have updated their asthma action plans, get their flu shots, and call me for worsening symptoms. Ebola virus is a prominent current event story. While it certainly is a problem, we should be sure to keep this in perspective. To date this year, there are approximately 6500 cases and 3000 deaths reported in West Africa. There is only 1 confirmed case in the U.S., a West African man who traveled to Texas by way of Brussels, Belgium. Known contacts have been isolated, and so far there has been no evidence of spread in this country. 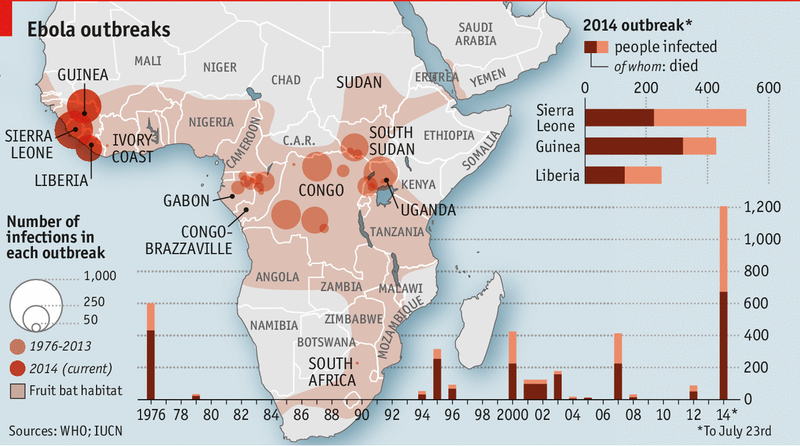 Ebola virus has been identified as a cause of human infections since 1976. It is named for the Ebola River in South Sudan. It is very infectious- studies suggest a single virus may cause fatal infection. However, it is at most moderately contagious. Humans can only be infected by contact with the bodily fluids of infected individuals (and only if ingested through mucus membranes like eye, nose, mouth). It cannot be spread before one is contagious or after one recovers. It is not airborne like influenza or measles.